Is this just another marketing attempt to capitalize on Porsche’s heritage or does the new 911R deliver the driving experience worthy of the legendary R badge? Well the initial response at first glance has been, “It’s just a manual GT3 without a rear wing”. And although it is true that the new R has a mandatory stick and no rear wing, there is much more to the most expensive Carrera based offering after closer inspection. In an internet nutshell… The new 911/991R is blessed with the GT3 RS 4.0L 500 HP engine that propels the R to 60 mph is 3.7 seconds with the third pedal on the floor (.6 seconds slower than the PDK equipped GT3 RS). The R is clad with carbon fiber GT3 fenders, hood and deck lid that tip the scales at 3,020 pounds (lighter than a GT3 RS). 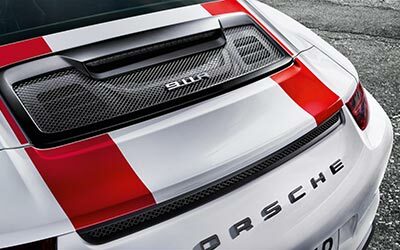 Minor exterior changes include redesigned front spoiler lip and a rear underbody diffuser that have been specifically designed to enhance handling with the sleek wing-less R. The magnesium RS roof has also been carried over to the R for improved CG and overall weight making the R 110 pounds lighter than the GT3 RS. The interior of the new 911R features styling accents that are a throwback to the original 1967 R. Tartan cloth seats, retro-modern R styled gauges, pull strap door handles, deleted radio and AC remind you that this Carrera is designed to be a dedicated driving enthusiast machine. And of course an R specific numbered badge ranging from, you guessed it, 001 to 991. Prices are expected to be around $185,000 “if” you can even find the opportunity to purchase this very limited Carrera. 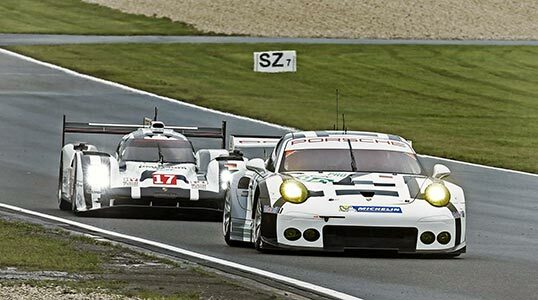 Still basking in the glory of their 17th overall Le Mans victory just 2 months ago, Porsche continued it victorious momentum into round 4 of the FIA World Endurance Championship at the 6 hours of Nürburgring. Porsche not only claimed the top 2 steps on the P1 podium but also filled the top 2 steps on the GTE-Pro category Podium with the 911 RSR’s. Mark Webber cruised to a dominant one-lap win of the race, following a near-flawless run for the No. 17 Porsche 919 Hybrid. Sister pole-sitting entry of Neel Jani led from the start but Brendon Hartley took over the lead in the second hour when the No. 18 car was hit with the first of three penalties for exceeding fuel consumption. They would later charge back through the field to claim second place. It marked all three drivers’ first overall wins in WEC competition, while the German manufacturer’s first LMP1/GTE-Pro sweep as well. For Webber, the win comes at the same track where the Australian scored his very first career F1 victory in 2009. In GTE-Pro, Richard Lietz and Michael Christensen gave Porsche Team Manthey its first class win since Shanghai of last year, following an equally strong run in the production-based ranks. Lietz took a one-lap win over the sister No. 92 Porsche 911 RSR of Patrick Pilet, after the Frenchman was forced to serve a late-race penalty for an early incident by co-driver Fred Makowiecki. The WEC heads next to Circuit of The Americas in Austin for the Lone Star Le Mans weekend on Sept. 17-19, which will feature TUDOR United SportsCar Championship and WEC races over a single day.